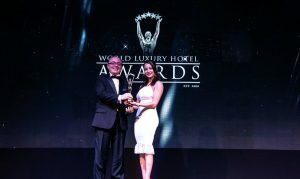 TAMANI Marina Hotel & Hotel Apartment in Dubai, located right in the heart of the commercial business hub of Dubai Marina, was declared the 2018 Luxury All Suite Hotel at the 12th Annual Gala Ceremony of The World Luxury Hotel Awards (WLHA) held on November 10, 2018 in Bali, Indonesia. 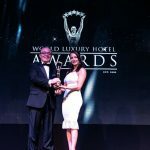 The World Luxury Hotel Awards is a recognized global organization providing luxury hotels with recognition for their world-class facilities and service excellence provided to guests. The TAMANI Marina Hotel award serves as recognition of sustained commitment to excellence and outstanding achievement in the international luxury hospitality industry. “We are looking forward to improve our market positioning after receiving this award; it is a recognition and will further motivate us to enhance our services,” Walid added. Michael Hunter-Smith, Group Marketing Director for the World Luxury Hotel Awards said: “We congratulate all our winners for the 2018 Award Year, who through their tireless efforts and endless passion to elevate their guests experience, have received this honour. True luxury is not easily attained, it takes a team of highly efficient and dedicated staff willing to go the extra mile and stop at nothing to ensure that every guest feels cared for and no challenged not solved. This is the definition of luxury; this is what makes the winners shine at the World Luxury Hotel Awards event”. Spreading gratitude to the people who have contributed to the business all year long, TAMANI Marina hotel shared the award with its employees who in turn expressed their excitement promising to further display commitment and excellence service to their guests while showcasing the culture and vision of the company. WLHA attracts more than 300,000 votes every voting season, where hotels compete against each other on the local, regional, continental and global scale. Regardless of a property size, delivery service, luxury and presentation of a property are considered as the criteria of judgment, so being a winner reflects the level of finesse and luxury a winning property has. What makes WLHA distinguished from other classifications’ methods such as the hotel size, location, target markets, levels of service, facilities provided, number of rooms, ownership and affiliation that it classifies hotels based on customers’ experience and actual guests’ reviews. TAMANI Marina Hotel and Hotel Apartment has the distinction of being the leading family oriented all-suites hotel in Dubai. Each of its 55 storey’s evokes a unique breathe of the Palm and Marina Waters, symbolizing discrete luxury, making it a perfect choice for vacations, gatherings or enjoying a leisure trip with families and friends. The hotel offers spacious rooms, kids playing area, pool, well equipped gymnasium and the restaurant Café Society, offering sumptuous delicacies and the feel of Glitz and glamour all year round. AYANA Resort & Spa, Bali, Indonesia was the venue of the prestigious black-tie event celebrating the 12th anniversary of the World Luxury Hotel Awards. Over 360 guests flew in from around the world to attend the event, which awarded the world’s finest hotels for their luxury offerings and exceptional service delivery. The next “2019 World Luxury Hotel Awards will take place on Saturday, 12th October 2019 at Arctic Circle, Finland.